Rocks vs. Mulch: What's the Best Choice for Residential or Commercial Landscaping? Choosing the ideal flowers, trees and other plant life to adorn a residential or commercial landscape is among the most important decisions to make in the landscaping process. The natural beauty of the budding flowers and cascading bushes adds an aesthetic appeal that brings monetary value and attractiveness to the property. Creating meticulously constructed flower beds, gardens and hardscapes around the yard provides a clean and distinctive look to enjoy. However, the final picture is not complete if you don’t include the finishing touch for a polished look: mulch. But with so many options available, how do you decide between organic and inorganic mulch options versus a rock filler? When trying to give your flower beds and gardens a pristine look, mulch is a great choice for homeowners and landscapers. It is typically quite affordable and won’t break your budget when you’re preparing your landscapes each spring. When compared to river rock options, organic mulch can often cost three-to-six times less at purchase. It is also widely accessible and can be found or purchased through home improvement stores, lawn and garden centers, big-box chain stores, and even many neighborhood gas stations. Mulch is good for the environment and your plants, flowers and trees. Organic mulch breaks down over time, since it is made of natural materials like shredded bark, wood chips or compost. This provides important nutrients that encourage plant growth and vitality and soil nutrition. Organic mulch provides natural temperature regulation for surrounding plant life. When applied in appropriate amounts, organic mulch acts as a blanket in colder temperatures to keep underlying plants warm and protected, and it helps to keep growing plants and underlying soil cooler throughout warm, seasonal weather. The composition of mulch reduces water evaporation in the ground. Because organic mulch keeps the ground cool and moist underneath during warmer temperatures, plants are able to stay hydrated longer. This saves you valuable money and time that would otherwise be spend on additional watering. A proper layer of mulch (2”-3”) will drastically reduce weed growth, cutting back on the time that will be required to pull out weeds by hand that tend to pop up over those spring and summer months. Yes, mulch is extremely common, easily accessible and offers numerous benefits for consumers and nature, but there are a few important cons to consider that might make you think twice before you make a final decision. The wrong amount of mulch could actually be harmful to your plants. Too much mulch could actually suffocate budding flowers or hinder plant growth. Putting too little mulch down around plant life might prove ineffective, allowing weeds to continue to grow where they are not wanted. Mulch must be replaced or filled in annually. Organic mulch breaks down because of its natural properties, leaving gaps for weeds or unwanted plants to pop through. Depending on the size of your property, the added expense of annual replacement can get costly over time. Don’t put your mulch down at the wrong Yes, this is a warning! If you fill your beds and gardens with mulch too early in the season, it may slow down or inhibit plant and flower growth. If you put down your mulch too late in the season, it may not stop pesky weeds from germinating and sprouting up as intended. Mid-to-late Spring is typically the right time to install mulch, so watch the timing and plan carefully. Rock is a popular choice to line walkways, fill gardens and accent beautiful plants and flowers. The diverse choices available make rocks an ideal choice no matter the region or location. So, why exactly are people all over the nation choosing rocks over organic mulch for their gardening needs? River rocks are low maintenance- they don’t wear down easily and last for a very long time. You won’t have to worry about filling in gaps unless outside forces (like playful children) move them out of place. 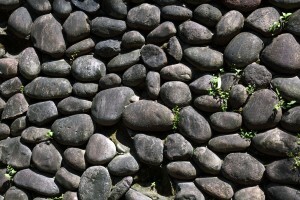 Because rocks are a low maintenance, long lasting option, they will save you time and money over the years. They will most likely cost more up front, but their longevity will pay off as the months and years go by. Rocks are heavier than organic mulch and are typically more efficient at preventing soil erosion. They also are an excellent choice for keeping away persistent weeds that might otherwise choke out flowers and other plants. Rocks are an ideal choice in warm climates or those with sandy soil and accentuate gardens with succulents and cacti. Rocks direct water away from plants that do not thrive well in excess water. Rocks are attractive and offer a wide range of colorful options for accenting pools, walkways, gardens and other hardscapes. 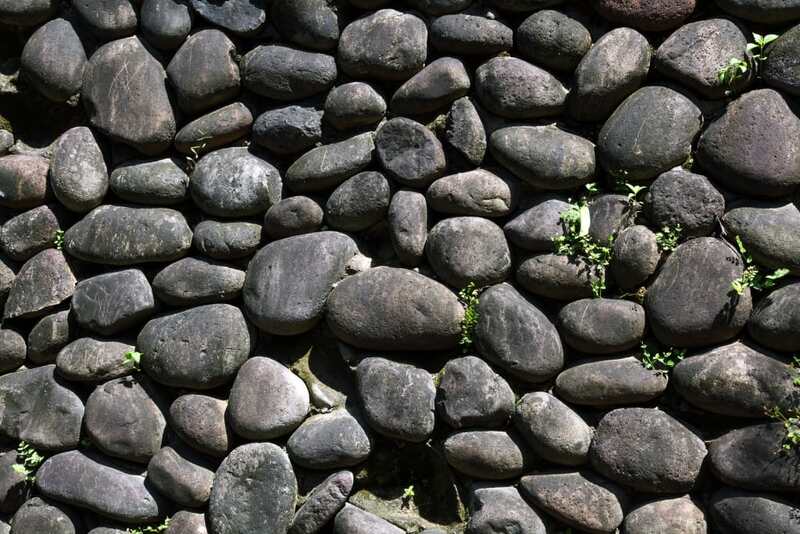 For homes and businesses located in regions prone to wildfires, rocks are an ideal, safe choice for filling beds and gardens because they are fireproof and will help provide a natural barrier around buildings and other structures. When planning out your gardening or landscaping project, it might seem like utilizing river rocks instead of mulch might be the right choice. But, before you start picking out rock types, there are a few negatives to consider. Rocks offer no added benefit to the soil underneath or the surrounding plant life. They do not provide any nutrients to plans and can actually be harmful to some trees. Trees grow best in acidic soil, but rocks cause the soil to become alkaline. Rocks can actually increase soil temperature too much, making the underlying ground too hot for many flowers and plants to grow and remain healthy. Rocks are heavy, but they can shift in place due to a variety of causes. When this happens, their shape and size can allow for stubborn weeds to squeeze through. Rocks are ideal for permanent landscapes. If you change the design or more the landscape, rocks must be removed manually. This can be exhausting if you do the work yourself, and costly if you decide to hire a professional. If you’re trying to decide whether mulch or rocks would be the best choice for your landscape project, contacting a professional landscape designer can help make the process a little easier. Their knowledge of plants, soil, and landscape architecture can help you determine which choice will offer the most benefits to your natural surroundings and fit your budget and needs most closely. To learn more information about mulching options or to discover all the ways your landscape’s potential could be brought to light, contact Twin Oaks Landscape today at 734-213-6911.